If you have items to include for the News Page please contact the, webmaster. David Cornes, David Lloyd and Frank Sharps represented Crake Valley in the NW Fed Level Play competition held at Bury on 17th April. Against a very strong field all our players showed their skills with good play but just failed to qualify for the finals. Our highest placed player was David Cornes who finished with 4 wins out of 6. His 2 losses went all the way to the 13th and final hoop against Libby Dixon (Pendle Handicap 3) and the eventual winner David Walters (Bowdon -3). The photo shows some of the competitors. Our thanks to Jean Hargreaves and her colleagues at Bury for a great day. 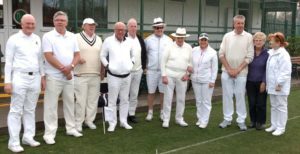 The 2019 Golf Croquet league started with a visit to Chester on Sunday 14th April. 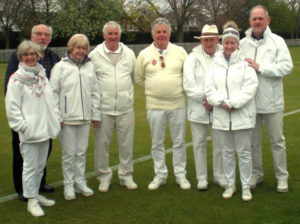 On a blustery and cold day some close games were played in a good sporting manner. There was never more than 1 game difference between the teams before a very strong finish ensured Crake Valley came away with a 10.5 to 7.5 scoreline. Player of the Match was Peter Uglow with 3 wins and a draw in his singles along with a doubles win at the outset. 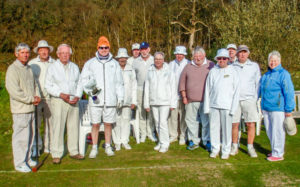 On a beautiful, warm and sunny day the competitive season started with sixteen enthusiastic players from across the NW Federation gathered at Crake Valley Croquet Club for the annual Alternate Stroke Doubles Tournament. 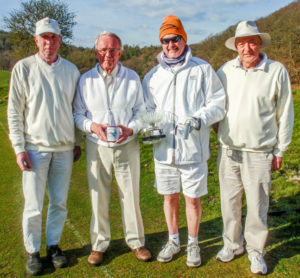 The players were from Bury, Pendle, Keswick and Penrith as well as Crake, and the tournament lived up to the expectation of high-low partnerships allowing practice for the pairings in a friendly but competitive environment. The ninety minute/14 point games were generally decided by a couple of hoops and everyone got plenty of lawn time allowing for both break-building skills and winter rust to show. Play was organised into two seeded blocks of 4 pairs on an all play all basis. The block winners went through to the final with an additional game to decide 3rd and 4th places. The strong partnership of Barbara Young and Margaret Eccles from Bury decisively won Block 2, but the news of the day was from Block 1 where Simon Robins paired with David Cornes (in his first attempt at AC) representing Crake. The results were impressive with 3 wins out of 3, setting up a highly competitive final. From the off the game swung first one way then the other with the lead changing hands several times, as time went Robins and Cornes were leading by 2 hoops, but the result was still in the balance during the final turn for Eccles and Young, with one misplaced rush that could have proved decisive and set up a 3 ball break for the final hoops, just nine inches out – the margin between first and second. The third and fourth place play-off was between the top seeds, Gary Wilson (Pendle) paired with Steve Skelton (Keswick) against John Henderson and Robin Swindells, both of Penrith, this match also exceded expectations and produced a Golden Hoop finish with Wilson and Skelton emerging victorious. Many thanks must go to all the visitors who made the event so enjoyable and to Crake members whose efforts made it possible. Crake Valley Croquet Club has been awarded 2 further local community grants towards our lawn and clubhouse development plan. The Eric Wright Trust has approved £500 and ASDA Barrow in Furness £1,010. The Croquet Association has also approved 50% towards some major parts of the renovation including the provision of electricity to the site, demolition of existing building, concrete base and a metal storage shed. There are still significant funds to raise but we hope the project can be financed and completed during 2019. 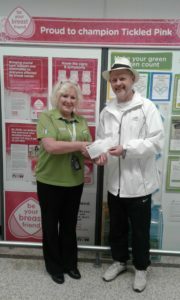 The picture shows Committee Member David Cornes receiving a cheque from ASDA’s Gill Gerish. The next internal fundraiser is our Spring Lunch to be held at Holker Hall on 20th March. Crake Valley have been notified that we have been awarded £1,000 by the Aviva Community Fund. We are grateful to all who supported for us in this public vote. The money will be used specifically to help us renovate land to almost double our available playable lawn space. We have also had notification from our local Parish Council that they fully support our “Croquet for All” development plan and they have committed to giving a £500 contribution towards the costs. Internally the club has continued fundraising by hosting a New Year Raffle and we are planning further functions during 2019.